Don’t know what Running Man is? You’re missing one of the best Korean variety shows on TV! 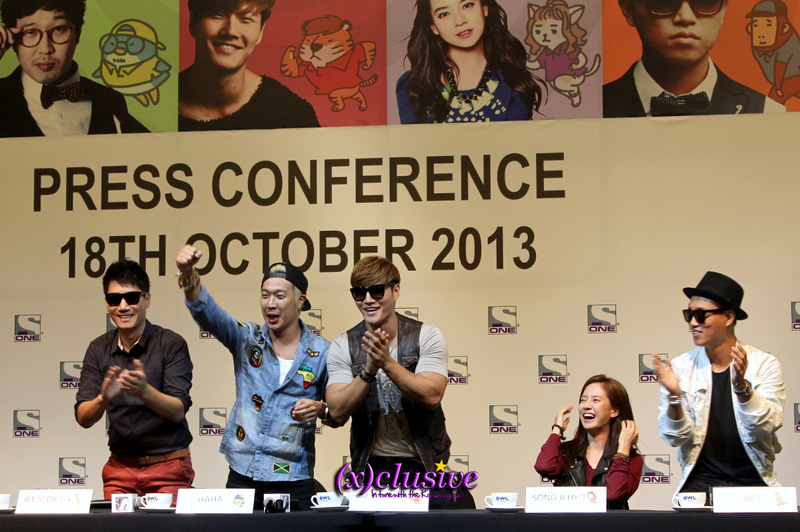 Didn’t make it to Running Man’s Fanmeeting in Singapore? You missed a lot of fun, laughter, lovey-doveyness and lots of amazing performances! The crew from popular Korean variety show ‘Running Man’ came down to Singapore for their first ever fan meeting last month! This was also ‘Ace’ Song Jihyo‘s first time participating in the Running Man Fan Meeting Tour, and her first time in Singapore as well. When asked about her impression of Singapore, Jihyo said she was surprised by the warm welcome she received, and was glad to be here. It was also Jee Seok Jin‘s and Gary‘s first visits, and they praised Singapore’s scenery, clean air and Gary even got to enjoy some clubbing! Meanwhile ‘second-timers’ Kim Jongkook and HaHa couldn’t stop talking about the chilli and pepper crabs, and Jongkook even commented that he loves the trees in Singapore so much he’d be the ambassador for them if possible! Tough as she sounds, Jihyo kept a shy demeanour through the press conference, and when the topic of her ‘love line’ with fellow member Gary (they are also known as the Monday Couple), she kept laughing shyly. On a recent episode of the variety show, Gary gave her a peck on her cheek, and it was an inevitable question – When did Gary get so courageous, and how does Jihyo feel about it? Following after at the actual Fan Meeting at EXPO, fans of the Monday Couple were further treated to more ‘love declaration’ from the two! As fan games were played throughout the show, the Running Cast were split into two teams: Gary and Seok Jin in Team A, Jong Kook and HaHa in Team B, Jihyo as the ‘Ace’ who can help both sides. During one of the games when the teams had to do a couple dance, Jihyo danced together with Team B. That led to Gary having a comical outrage due to jealousy, which was met by Jihyo‘s sudden confession – “No! I love you!” which caused an uproar, with the other crew members teasing them about it after that! One of the highlights of the Running Man Fan Meeting were the performance stages put up by the Running Man Cast. It’s a much less-known fact that comedian Jee Seok Jin was actually a singer who debuted back in 1992, and he impressed the audience with his rendition of English song “I Swear” by All-4-One. 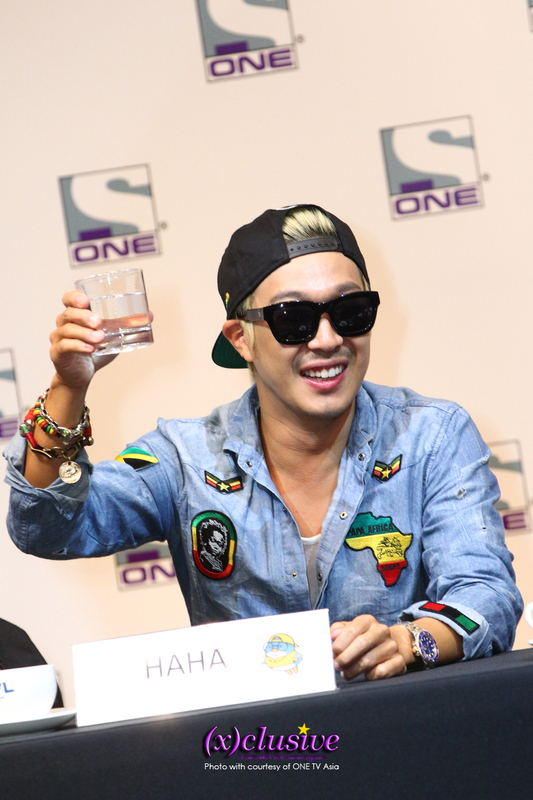 Gary is also part of hip-hop duo Leessang, while Kim Jong Kook and HaHa are a singer and reggae artist respectively, bringing their exciting songs to the stage, turning the fan meeting into a mini-concert which was nothing like the usual K-Pop concert. Ji Hyo who is the only actress of the group had a joint stage with Gary, as they sang a duet “Turn Off The TV” to much of the fans’ delight. Although she may not be a good singer, the Monday Couple‘s chemistry got the fans’ cheering for more. The Fan Meeting ended on a high note with the whole cast coming together to perform Leessang‘s “Let’s Meet Now!” and Kim Jong Kook‘s “Lovable”, turning the venue into a party as fans waved their hands in beat. As Jee Seok Jin said, “I always wanted to visit Singapore and I’m really glad to be able to come here, I know of the Singapore Flyer and hope we’ll be able to film an episode there one day.” We sure hope so too! Don’t forget to tune in to Channel ONE every Friday, 11:45PM, to catch the latest exciting episodes of Running Man! Channel ONE can be watched via Starhub channels 124, 820, 823 and 876, or Singtel mioTV channels 13 and 604. Much thanks to ONE TV Asia for the invitation to the event! ← (x)clusive! : Be NU’EST’s Fine Girl at Vizit Korea 2013!